Victoria Lodge has thirteen rooms including nine studios which can sleep up to three people and four two-storey 2 bedrooms apartments which can sleep up to seven people. The self-contained apartments have kitchens with ovens, full-size fridge with freezers and a microwave giving the flexibility of enjoying your meal in your accommodation. The studio rooms are well priced and include small refrigerators along with microwaves and tea and coffee making facilities. If you need any assistance during your stay, whether you want to enquire about our facilities, or need to arrange bookings to any of Rotorua's many attractions, our friendly team is here to help. 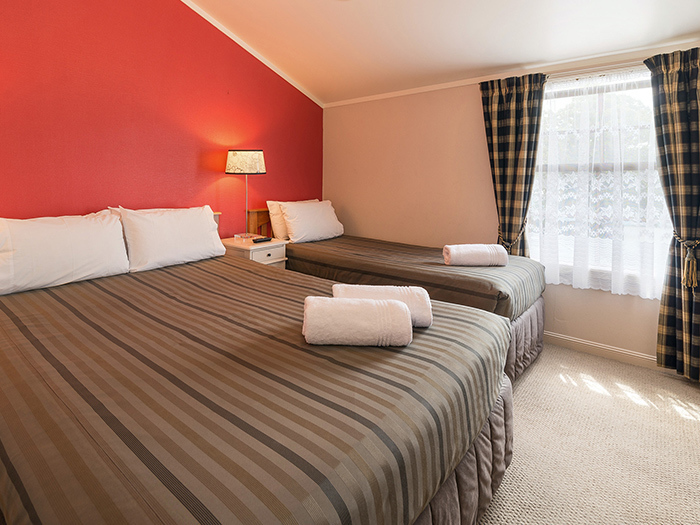 Whether you are looking for family accommodation in Rotorua, romantic gateway, or booking Rotorua motels and hotels for business trips, Victoria Lodge is your first choice. Contact us today to see how we can help you or make a booking online. The queen studio rooms sleep two people and are perfect for solo travellers, couples or business travellers. Queen studio rooms are equipped with a queen bed, flat screen HDTV, a table with two chairs, an easy chair, a microwave, a small fridge and tea making facilities. They include an en-suite bathroom with shower, toilet and vanity plus an attached private, outdoor, concrete hot pool. The twin studio rooms sleep two to three people and are the perfect holiday escape for couples, business travellers or small families. Twin studio rooms are equipped with a queen bed, single bed, flat screen HDTV, a table with two chairs, a microwave, a small fridge and tea making facilities. They include an en-suite bathroom with shower, toilet and vanity plus an attached private, open-air hot pool. All rooms benefit from our FREE unlimited ultra-fast WiFi, FREE onsite parking (1 carpark per room) and FREE usage of our BBQ area. Guests have the option to book a delivered continental breakfast and have the option to book a designated pet-friendly room for those travelling with pets. The two bedroom apartments at Victoria Lodge are perfect for larger families or groups wanting to stay together. On the first floor - Two bedrooms with queen and single bed in one room and the queen bed in the other room. Bedrooms have flat screen HDTV. The Bathroom has spa bath to suit 1-2 people plus shower, toilet and vanity. On the ground floor - There is a lounge with 2 settees, an easy chair, coffee table and flat screen HDTV with 50+ SKY channels. A dining area that seats 6 and a kitchen with fridge/freezer, microwave, hobs, an oven, crockery and cutlery. The apartments sleep up to 5 people and at a pinch, can sleep 7 with the fold out settee. All apartments come with FREE ultra-fast unlimited WiFi, FREE onsite parking, FREE usage of our BBQ area and are serviced daily. Victoria Lodge offers four-star accommodation with a range of rooms backed by friendly efficient staff and great facilities. One of the best motels and hotels in Rotorua, Victoria Lodge is centrally located, just a two-minute walk from the CBD with all its restaurants, shops and attractions but situated in a quiet area ensuring you get a good night's sleep. 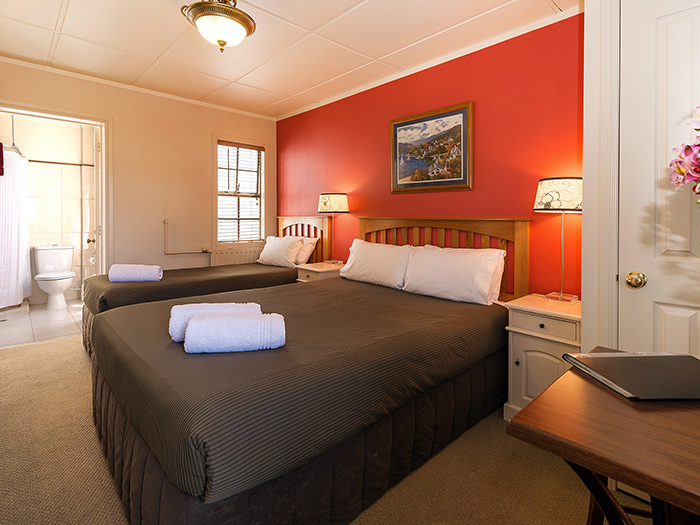 Rooms are serviced daily and guests can book a home cooked or continental breakfast. If you are looking for dog-friendly accommodation, talk to us about booking one of our pet-friendly rooms so you can bring your four legged friends with you. Victoria Lodge's central location makes it the ideal choice for family accommodation in Rotorua. From here it is just a short walk to the CBD as well as many of Rotorua's best parks and open spaces. Take a stroll through the Government Gardens, just five minutes from our motel, or let the children run off some energy at the playground in Kuirau Park which is ten minutes walk away. The staff at Victoria Lodge have great local knowledge and can give you advice on everything from how to fill your days to the best places to get a bite to eat. If you want to visit some of Rotorua's attractions talk to us about whether we can arrange a discounted entry. Contact us today to book your holiday accommodation in Rotorua. We look forward to welcoming you.